E.H. (Jim) Ammerman, along with his wife Charlene, are the founding President and Director of Chaplaincy of Full Gospel Churches (CFGC), Inc., an endorsing agency recognized by the Armed Forces Chaplains Board. CFGC is a worldwide ministry that operates from Dallas, Texas area, providing support to the U.S. Armed Forces, U.S. Government agencies, and civilian organizations. He has served as the President and Director of CFGC since 1984. 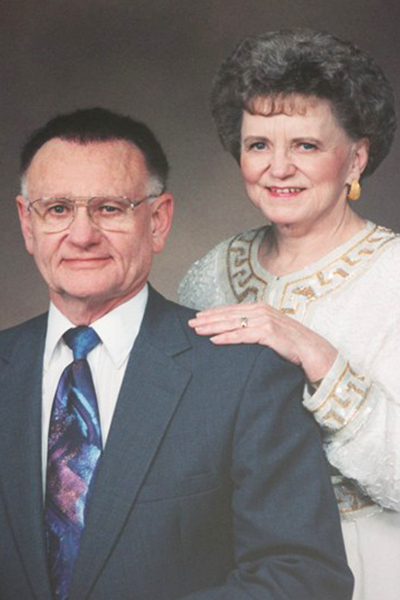 In February 2010, Jim and Charlene officially retired and accepted the position of President and Director Emeritus. Born in Conway, Missouri, on July 20, 1925, Jim is a graduate of Baptist colleges and Seminaries. Spirit-filled in 1938, he has been an ordained minister since 1946. He holds both Doctor of Theology and Doctor of Divinity degrees. Jim retired from the U.S. Army in 1977 as a Colonel, having served as an Army Chaplain for 23 years. During his Army career, Jim served as a paratrooper chaplain with the 82nd Airborne Division and the 101st Airborne Division (while General Westmoreland was commanding) and with the Green Berets for five years. He also served twice with the 1st Cavalry Division and once with the 1st Armored Division. Prior to his service as an Army chaplain, Jim served 3 1/2 years with the Navy as an enlisted radioman and later as a Naval aviator during World War II. His last European assignment was with V Corps in Frankfurt, Germany, where he supervised 83 chaplains representing 14 denominations who provided religious coverage and support to 50,000 soldiers and their family members. Jim’s last active duty assignment was at Fort Leavenworth, Kansas, where he served as Post Chaplain and pastor to the Command and General Staff College (CGSC). At that time, CGSC annually trained a 1,000 of the Army’s and its sister services’ most promising mid-career officer students. The graduates of this prestigious school go on to serve as senior leaders of our nation’s military, its Colonels, Generals and Flag Officers. With literary credits in several professional journals and religious publications, and the books After the Storm [Desert] and Supernatural Events in the Life of an Ordinary Man, Jim has appeared frequently on radio and television as a guest on CBN’s 700 Club, Rays of Hope, Festival of Praise, TBN, and host of other programs. Additionally, he is a much-loved speaker at Spirit-filled meetings and conventions of all descriptions and denominations and at Full Gospel Businessmen’s Fellowship International gatherings.